Have you ever walked through a city and felt completely lost and out of place? Many cities around the world can make you feel like that, New York for one for the sheer expanse of its high-rise buildings that have you constantly looking up. Strangely, when you hit Central Park the rhythm and pulse changes in an instant. But still, it is easy to feel lost. Similarly, Cape Town allows you to bob and weave between moods and experiences, all at the pace of a delightful stroll or a short taxi ride. And of course, day-trips to the West Coast or Winelands offer their own special reward. 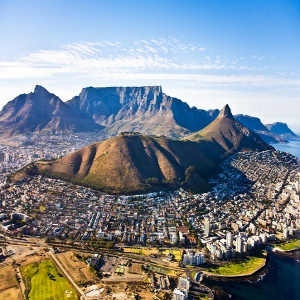 Despite being a global tourist attraction icon – simmering beneath the grey granite of Table Mountain, the city lets you know more or less where you are at any given time thanks in part to the unique natural amphitheatre shape. Table Mountain, Devil’s Peak and Lion's Head cocoon the city bowl, which offers up a cosmopolitan buzz (First Thursdays are a prime example), an extra loud noon-day gun bang when the cloud cover is thick and of course unexpected leafy suburbia without the mundane. A stay at any one of the boutique hotels in the high-lying suburbs of the city, which slope all the way down through Oranjezicht, Fresnaye and on towards the Atlantic Seaboard spots of Green Point and Sea Point brings this to life. Cape Town’s unique mountain-like hug is especially felt, front and centre from the pool deck of the Cape Milner Hotel, located in Tamboerskloof. It offers a good mix of old-world charm and boutique-style living yet located centrally to not feel like you’re well and truly out in suburbia. If you’re a local looking to base yourself in the mother city for a long weekend staycation, business trip or an out of towner wanting to explore South Africa's top tourist spots here’s what you need to know about the Cape Milner. If you’re staying in the city, it is very hard to find a bad location. The Cape Milner is delightfully central, with the sights of Cape Town all within easy reach. They operate a daily shuttle both week days and weekends to the V&A Waterfront, Camps Bay’s beaches as well as to Table Mountain and the City Centre. All of these are an easy walk away too – you can’t go wrong spending an evening strolling down to Bree Street either which has firmly made its mark as a place to eat and be seen in the city centre. Of interest would be Hanks, Jason’s, La Parada, Mink & Trout on Bree Street and Revolution Cycles. There really are plenty of things to do, with eateries, museums, galleries and dance halls to suit all tastes. This 'urban' retreat is a good-value offering, especially in this pre-winter, post peak-season period. If you do get in touch, enquire about their latest value add deals. Offering exquisite views of Table Mountain from your hotel room, it is a lux, four-star stay that puts you front and centre to an urban escape in one of the world's most highly prized tourist spots. Currently they have a Last of Summer promotion, running until the end of April at a costs R850 per person sharing per night in a standard room, and includes breakfast, as well as a complimentary three course dinner at the exclusive 2 on Milner restaurant, if the stay is for three consecutive nights. Prices for a standard room are usually about R1 980 for a single and about R2 623 for a double. As a boutique style hotel, which forms part of the Extraordinary Collection (They have properties located across SA, Zimbabwe and Botswana), it has 57 rooms including two suites and ten luxury rooms. We stayed in a family luxury room – each with an en-suit bathroom and with two rambunctious boys the space was welcoming. The size of the rooms really is above average in the luxury suites. It’s quite family-friendly and one child under 12 stays free. The staff also went out of their way to make a fuss of my boys and on arrival families with kids will find goodie and activity bags in their rooms as well as healthy snack treats. They can also arrange babysitters if needed. According to the Cape Milner, interior designer Beth Murray has been involved with refurbishments at the hotel for almost a decade, ensuring that the property’s style keeps continuity as it evolves. The rooms have a neutral palette and there is a play on textures, but it more inviting than overdone. Each of the Cape Milner rooms offer en-suite bathrooms, air conditioning, wireless internet connectivity, complimentary tea/coffee making facilities, remote control television, hairdryer and mini safe not to mention MNet and DSTV viewed on 32 inch LED flat screens in the bedroom and 40 inch LED flat screens in the suites and luxury rooms. If you’re inclined to spending the night in your room and not venturing out of the hotel, then the Glass Lounge is a beautiful and modern stay-in dining option. They have an extensive cocktail list and quite a good menu - not entirely child-friendly though (blame young unrefined palettes that prefer pizza to squid) and a bit lacking when it came to the cherry on top of the meal – dessert. One of the dishes we ordered was unavailable and a macaroon in another dish appeared partially frozen. The cheese burger however is an appetite pleaser and was cooked to perfection. I also wouldn’t hesitate to order their tapas snacks for some pool-side Friday afternoon drinks. The buffet breakfast which is included in your stay is well presented and includes all the standards you would expect like fresh fruits, a selection of cheeses and cold meats as well as a hot breakfast offering. If you visit during a busy period, and they were during our stay – some of the popular options like bacon and eggs might run out and it took a while to replenish. So, if you’re pressed for time or want to make it up Table Mountain before the queues begin, best to rise and shine early. The Cape Milner also prides itself on its state-of-the-art conferencing facilities, which overlooks it overflow balconies and relaxing pool deck, making it a"meeting place, and meeting space". For the most part the staff are very hospitable and being so centrally located, your stay should be jam-packed with the best Cape Town has to offer – which makes retreating to the urban escape of the Cape Milner ideal. Disclaimer: Traveller24 Editor Selene Brophy was hosted for her stay at the Cape Milner Hotel.